Furuno's DFF1 is a network sounder featuring Furuno Digital Filter (FDF) Technology designed for use with the NavNet series. This digital Network Sounder can turn any NavNet display into a powerful, dual-frequency digital fish finder. 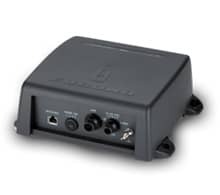 The compact network sounder unit connects directly to a NavNet display or an Ethernet hub with a single Ethernet cable. If it is connected to an Ethernet hub that has multiple displays attached, each of those displays will have access to the Network Sounder.